Readers who want a better understanding of what Greenberg wrote and why, and above all why what he wrote was so significant, would in any case be better off if they ignored [the] biographies and did the harder but more rewarding work of reading Jones’ dense, indeed sometimes maddeningly verbose, “critical history.” Like [the biographers] Jones leans on biographical material … along with Greenberg’s own writings as well as reactions to and (and against) Greenberg by the art critics and historians that followed in his footsteps; but she brings to all this an analytical intensity, an almost ferocious determination to dig into the text, that makes the biographers’ declarative flatness seem dull by comparison. 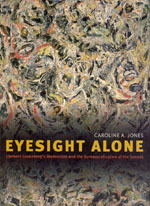 The hundred pages she spends analyzing Greenberg’s writings on Pollock—minutely sifting the critic’s words through her own searching re-examination of the paintings he had in view—are alone worth the price of the ticket. … The strength of Jones’s book is the sense of how complicated a thing it was for Greenberg to become Greenberg.